Lotte Lehmann affected my life in two significant ways. The first was through her supreme artistry and communicative powers, as revealed through her recordings, teaching, and writings. The second was more personal: despite being revered in the world, she became a treasured grandmother figure to me. In 1961, when I first encountered Lehmann, she had retired from her official teaching duties at the Music Academy of the West. At the time, like many instrumentalists, I held an unspoken prejudice that singers were our inferiors as musicians. So when I drove Katsuumi Niwa, a baritone friend of mine, from UCLA to Santa Barbara for his lessons with “an old German lady,” I expected to be bored. She was courteous to me, but during that first lesson I napped on her sofa, in preparation for the long drive back to Los Angeles. But on subsequent visits, as I observed this venerable artist teaching and demonstrating, I felt as if I were entering a new musical world, where words existed on an equal plane with music. Through her profound knowledge and ability to share that with Katsuumi, I found myself gaining a newfound respect for all singers. As I followed along in my score, I discovered the depth of Lehmann’s approach to teaching and music-making. No longer did I hear merely a string of notes, at best a display of vocal prowess. Instead, from merely overhearing her tutelage, I found a wealth of meaning revealed to me in each word, each phrase. 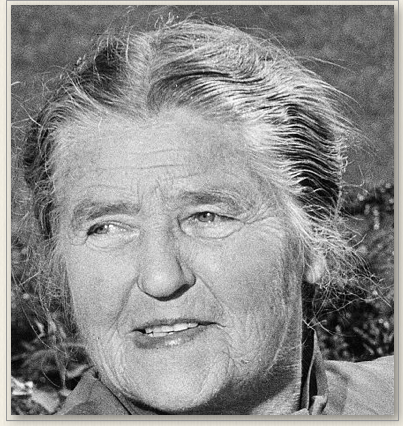 Madame Lehmann (and we did call her that) was the first genius I had met. Though, as an instrumentalist, I just observed Katsuumi’s lessons, Lehmann always treated me with kindness, including me in conversations that occurred after the lesson. Inspired by Lehmann’s teaching, I sought out her recordings and read about her. I discovered how she had impressed her audiences in both opera and art song by the directness and spontaneity of her utterance, as well as her instinctive musicality. However, her greatest impact on me as a musician came from observing her in lessons and master classes. Her insights into song literature even had an immediate and lasting effect on me as an instrumentalist. Not only did her ideas of musical phrasing inform my playing, but I always included a Lied or two on my solo double bass recitals. Here are, even after more than 50 years, a few vignettes of Lehmann as teacher that remain in my memory. When Katsuumi studied Pizarro from Beethoven’s Fidelio, I was amazed that Lehmann knew every note, word, and inflection of the role, along with ingenious insights into the character. In Pizarro’s aria “Ha, welch ein Augenblick,” she demanded venom in his delivery. Even more to my surprise, she was equally well versed in the subtleties of Ravel’s Chansons madécasses, which seemed so far from her German world. One of the great joys for me in attending the Music Academy of the West was its proximity to a breathtakingly beautiful beach. One day, most likely in the summer of 1963, I was swimming at this very beach when I realized with alarm that I was missing Singher’s regularly scheduled art song master class. Brushing the sand off my feet, I ran up the cliffs and directly into the lobby of what is now called Lehmann Hall. The Academy’s stern director stopped me at the entrance: “You can’t go in there without shoes!” Lehmann, seated in the back of the audience and overhearing the exchange, came to my rescue. “Gary,” she said, “come sit with me.” The director could hardly object to the invitation of one of the MAW’s founders, now Honorary President; I took my seat next to Lehmann. It was in the same class of Singher’s, if memory serves, that a soprano sang the Richard Strauss song “Ständchen.” At the song’s climax on the words “hoch glühn,” she held the high A for twice the notated length. After making his remarks, Singher noted the alteration, and said, “I believe that was all right with the composer. What about that, Mme Lehmann?” She rose and with conviction and pride in her voice said, “Ja, Strauss told me…” at which point laughter and applause rang out in the audience as she stood, beaming. Whenever I visited Orplid I was conscious of all the art work (not just paintings) which flowed from Lehmann’s creativity. It was another level of her involvement with art that seemed completely in concert with her musical interests. In Volume I you saw her art work for every song of Winterreise and in this presentation you’ll find the same attention to Dichterliebe. Die schöne Müllerin also received her intense artistic effort and will be shown in Volume III. Lehmann’s work on tiles, mosaics, sculpture, and drawings were everywhere in Orplid to enjoy. The painting below has just recently been found. Katsuumi and I arrived in New York in the fall of 1963, he studying with Jennie Tourel at Juilliard, and I at the Manhattan School of Music. Lehmann wrote that she was concerned that Katsuumi didn’t have enough warm clothes. Soon afterward, a large package arrived from her containing a beautiful overcoat, which was put to good use. Later in my years at the Manhattan School of Music, Lehmann planned to give a benefit master class for the school on 21 April 1965 at Town Hall. We had continued our friendly correspondence, so I was thrilled that she’d be teaching for the scholarship fund of my school. Paul Ulanowsky, her favorite pianist from 1937 until her farewell appearance at Town Hall in 1951, was to participate as accompanist for the class. I had met him during the summer of 1965 at the Yale Summer School of Music and Art, where he was teaching and I was a student. We had discussed his glorious years accompanying Lehmann. I later turned pages for him when the Bach Aria Group performed in Town Hall. Each time he shared Lehmann stories with me. Since I knew him, I was assigned to meet him when he arrived at MSM and guide him to the hall where he was to rehearse with the student singers. Mr. Ulanowsky remembered me in the genial, quiet way he had. The great day (night) arrived. The Town Hall stage was formal in its decoration with a great tapestry against the back wall, and a large antique chair for Lehmann. The evening was festive and memorable. The large number of students sang, received suggestions, tried again, and received a few words of approval from Lehmann. 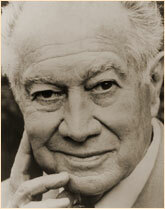 At the end of the master class, Lehmann coached a soprano on “Cäcilie” by Richard Strauss. After repeated attempts to achieve the right expression, neither Lehmann nor the student was satisfied. The beautiful young singer simply shrugged her shoulders signaling that she didn’t know what more she could do. Lehmann suddenly stood up for the first time that evening and went to the bend in the piano, as if to perform. Ulanowsky, able to transpose to any key, and in eager anticipation of once again accompanying this icon of his past, whispered in a voice that I heard in the balcony, “Madame, what key?” Lehmann replied, “Original key! I’m not going to sing, I just speak it through.” Then she demonstrated the song, with such passion—even though she barely sang it, in a breathy baritonal whisper—that I fully understood once again true vocal artistry. By virtue of this example alone, Lehmann could have transformed my life and proved why she was ranked as one of the greatest Lieder interpreters of the century. Small wonder that, when Lehmann had entered at the beginning of the evening, the entire sold-out audience had stood as one in her honor. After graduating from the Manhattan School of Music in June 1966, I went to the Philippines for my first full-time professional engagement, playing in the Manila Symphony. Shortly after my arrival, the orchestra’s conductor, Dr. Herbert Zipper, brought me an envelope addressed to me with Lehmann’s flowing signature on the back. Dr. Zipper, who had lived and worked in Vienna, was awestruck that this youngster should receive a letter from the great Lotte Lehmann. “Do you know Madame Lehmann?” he asked. “Oh, yeah, she’s a friend of mine,” I replied casually. “Please give her my best wishes and let her know that I am a great fan,” Dr. Zipper gallantly countered. The next month I moved to Germany, where I played as a part-time bassist in an orchestra in Munich. As a young, unknown American, I found myself unable to secure auditions for full-time orchestral posts. Without my asking, Lehmann kindly wrote a letter of recommendation that led to many auditions and an eventual post with the Symphony Orchestra of Berlin. Lehmann was pleased that I learned German; though I wrote her in that language, she answered in English. 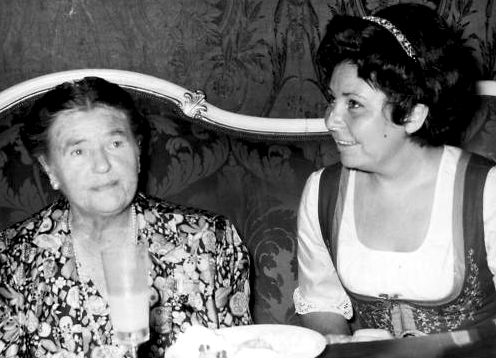 In 1974 I sent my impressions upon seeing Strauss’ Frau ohne Schatten in Munich. In response, she replied detailing her insights into the Dyer’s Wife, a role that she had created. In particular she wrote about the difference in the more realistic costume that the Dyer’s Wife wore nowadays. She also remarked that Munich had become the center of great operatic art that Vienna had been in her time. It pleased me to have Lehmann give the stamp of approval to the city I was enjoying so greatly. Each year on her birthday I sent a gift, no matter where I was at the time. I remember sending her a weird shell with spines that I found in a shop in Manila. At my request Denis Lund calligraphed “An die Musik” as a glorious document fit for hanging on the wall (he sent me a copy that I framed). Lehmann always answered with a nice thank-you note, and we continued to correspond until her death in the summer of 1976. I had noticed her once-flowing handwriting getting squiggly. Upon her death, I received letters from friends from around the world sending condolences, as if her loss was that of a member of my family. It touched me deeply that so many understood what Lehmann had meant to me. After her death, and especially after I’d returned to the U.S., I really became a “Lehmanniac,” as her American friends had once dubbed her avid fans. Not only did I listen carefully to her recordings, but also did what I could at the time (before the internet) to study her life. Here’s another such tangled web. Lehmann wrote in her autobiography that she wasn’t sure why she didn’t sing the role of Arabella in the Dresden world premiere of that eponymous opera of Richard Strauss. 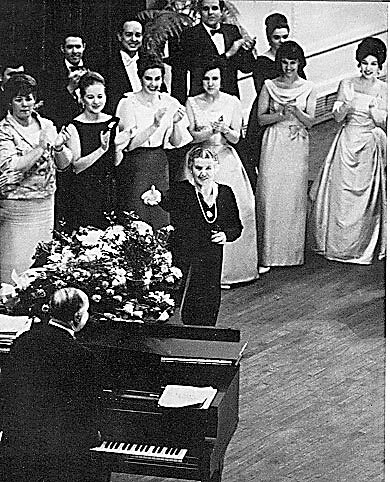 She sang the Vienna Opera premiere of Arabella, but Viorica Ursuleac, mistress of the conductor Clemens Krauss, sang the Dresden world premiere. The reason is not easily unravelled, but can be attributed to Lehmann’s vocal insecurity at the time of a busy season; her jealousy of the younger Ursuleac, who was slowly assuming her roles; and the fact that Krauss, who conducted both the Dresden and Vienna premieres, was becoming a favorite of Strauss, and of course favored Ursuleac. The other suggested reason that there were in 1933 developing “Austro-German border troubles,” may have been a convenient fabrication. …I have spent many, many sleepless nights trying to figure out how I could convey the real Lotte. The result—I came up with a different Lotte every morning. How can one ever put all the different Lotte’s together and make her credible?…. My intermittent Lehmann study continued. In 1987 I compiled the Discography for the Beaumont Glass Lehmann biography and made a presentation on that Discography at the 1988 Lehmann Centennial at UCSB. I learned a lot from that process: mostly how many recordings Lehmann had made, and in how many opera roles and Lieder. The time spent with the vocal record collector and discographer William Moran offered the opportunity to learn about early recordings, as well as about Lehmann. He confirmed the story that Lehmann told of doing recordings in Berlin (where she generally recorded) for a little shopping money. Recordings were generally a much lighter affair than they are now, hardly considered as one’s eternal legacy! The casual nature of recordings even up to 1951 also astonished me. The historic recording made of Lehmann’s Town Hall farewell was such a last-minute decision that the opening piano introduction to Robert Schumann’s “Widmung” was missed and Ulanowsky played it days later to be inserted at the beginning of the tape. Moran himself, as a young man, arranged to record Lehmann’s Santa Barbara farewell recital in August of 1951, setting up the microphone himself just in time for the recital. 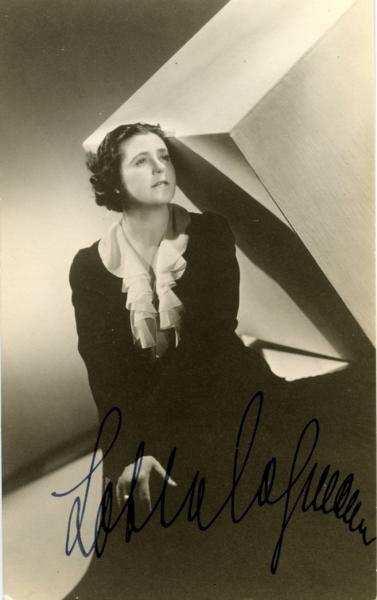 At the Centennial I learned about Lehmann’s history, her vocal-technical abilities and limitations. The esteem in which she was held by her colleagues and students was impressive. Shortly after the Centennial I began my work at Hawaii Public Radio. My first program there was on Lehmann: it included both arias and Lieder. After that, I began Great Songs which offered art songs every week. That was in the Fall of 1988 and as of this writing (2016) I’m still producing the program, now called Singing and other Sins. This broad exposure has brought me in touch with other specialists and it is from these kind people that I’ve learned things about Mme Lehmann that haven’t found their way into books. • Psychologist Dr. Herman Schornstein has kindly sent me copies of some of his Lehmann correspondence. You may read his Lehmann memories in the “Misconceptions” chapter, under “Was Lehmann Always So Serious?” In the chapter called “The Lehmann Others Knew” you’ll find his extensive Lehmann correspondence. Here, I’d like to quote the revealing portions of a letter she wrote to a woman in 1943. I paint—oil and watercolor, landscape and portraits—and I learn feverishly better and better painting. A terribly great joy gave me teaching which I started last season. Not vocal teaching—God how that would bore me!! !—but interpretation. Some will come out here to continue their studies with me. Why I tell you all those details about me? : I want you to know me. And to like me as I am. I never was a “virtuous woman.” I was rather bad when I was young. Does that shock you??? So—now you don’t like me perhaps. From this letter you can read all sides of Lehmann: self-absorbed, but honest about it; not a great intellect, but able to find creativity, inspiration, and imagination from her own being. She seemed to have the penchant of telling women (and even some students) about her past sexual indiscretions. At the end of the letter, she seems insecure. Her confidence varied widely and unpredictably. She felt certain about her acting and vocal/interpretive powers, her teaching, and her abilities as a Lieder singer. On the other hand, she sometimes worried that she couldn’t sing the evening’s opera, she feared that she looked too old or overweight on stage. She wondered whether her teaching was useful to her students, as she noticed opera production styles change. You can hear her recall discussing this with Bruno Walter in the audio found in the chapter “Misconceptions.” Lehmann dreaded death and wondered if she would be remembered at all. • In 2014 Christa Ludwig told me the following anecdote: Lehmann attended a Salzburg Festival in which Ludwig had sung the Marschallin in a Rosenkavalier performance, as well as a Lieder recital. Afterwards, when they met at a reception, Ludwig was hurt when Lehmann only complimented her recital. It seemed to her that Lehmann could never approve of any other Marschallin interpretation but hers. There’s no doubt that Lehmann recognized the kind of imprint that she’d left on that role. 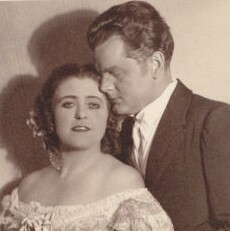 She may also have been jealous of Ludwig’s impressive technique: able to sing both mezzo and soprano roles. It’s true that Lehmann could be fiercely demanding with a student but a minute later she’d be smiling and content. While teaching, she had a stern, regal way about her in her seventies that belied the relaxed human side. All of these aspects of Lehmann’s art and personality can be in conflict and yet, when we hear the recordings, seem a complete, satisfying whole. Several writers have stated that Lehmann began her art work after retiring, but that wasn’t the case. I’ve learned that she painted earlier (see the foregoing letter of 1943) and here’s a profile 1932 portrait that she drew of her pianist Ernö Balogh. Yesterday the State Opera singer Lotte Lehmann needed to undergo a small operation for a neglected infected spot on the mouth proven necessary by Professor Dr. Lotheisen, assistant to Dr. Zifferer. The artist suffered violent pain already on the day of Piccaver’s Farewell Concert, but postponed the operation to avoid canceling. Miss Lehmann will withdraw from artistic activity for about two weeks.